Anxiety is a feeling of unease, normally worry or fear, and it is a natural human response to a threat. Ordinarily, it serves as a useful emotion because it focuses attention on solving the problem at hand and activates the natural “fight or flight” reaction. In short, anxiety has allowed humankind to survive by prompting ancient people to flee from animal predators. However, anxiety can become problematic when the feeling is chronic. Around 40 million Americans suffer from some sort of anxiety disorder, and these disorders can be caused by a variety of environmental, genetic, and hormonal factors. Developing an anxiety disorder often means the person is subject to anxiety episodes and panic attacks. Many people are confused between these two terms, so they are sometimes used interchangeably. However, they are two separate symptoms of anxiety. 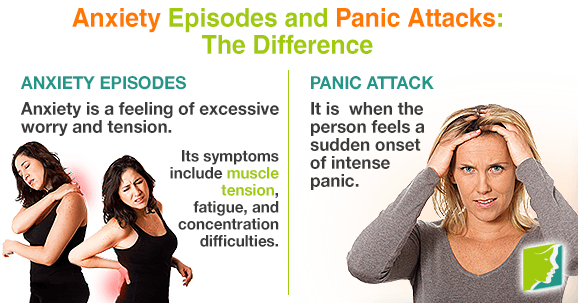 Keep reading to understand the difference between anxiety episodes and panic attacks. Anxiety episodes gradually intensify over time and refer to the chronic excessive worry that a sufferer experiences. Symptoms include muscle tension, fatigue, and concentration difficulties. Anxiety episodes will make the body produce more cortisol, a stress hormone, and too much of this can be harmful because it curbs body functions that would be non-essential in a “fight or flight” situation (running from a lion, for example). This results in a suppressed digestive system, reproductive system, and growth process. A panic attack is when the person feels a sudden onset of intense panic, and symptoms can often imitate a heart attack or respiratory disorder. Such symptoms include a rapid heartbeat, chest pains, the need to escape, and an overwhelming sense of impending disaster. Unlike anxiety episodes, panic attacks are short term and last only a few minutes, although at the time can be much more terrifying. Some tips on how to prevent panic attack are listed below. The natural temptation during a panic attack is either to hyperventilate or breathe far too deeply. Hyperventilation results in the body taking in too much oxygen and removing too much carbon dioxide, but the body needs these in balance. Therefore, when a panic attack threatens to occur, the best thing to take a series of deep, slow breaths - approximately 10 seconds each - for five to ten minutes. Exercise releases endorphins into the body, and this results in a better and relaxed mood. Integrating regular exercise into your life will serve to reduce the frequency of panic attacks, but an impending panic attack can also be stopped by a short burst of physical activity. It is recommended that all adults do at least 30 minutes of moderate intensity exercise per day for overall health. Panic attacks can occur at any time and are often frightening, sometimes giving the sufferer a sense they are going to die, whereas anxiety episodes are longer term. This being said, however, many sufferers who suffer from one type of anxiety will also suffer from the other. It is important to recognize the signs and seek medical help if you feel anxiety might be becoming an issue for you.